I made these last week, in a bid to get more dried fruit into Elliot. 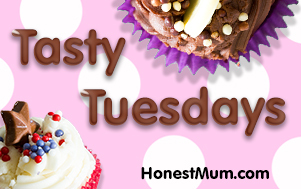 They are so yummy, I’ll be adding them to our list of regular bakes! To make, firstly heat your oven to 160C/fan 140C and get out a roasting tin. Put your oats, nuts and seeds together in the roasting tin and toast these in the oven for 5-10 minutes. Meanwhile, line and grease a 18x25cm tin. Next, measure out the butter, honey and sugar and heat in a pan over a medium heat until the sugar has dissolved. Once the oats, nuts and seeds have toasted, add these to the pan and then add the cinnamon and dried fruit. Stir really well to get everything coated fully, then tip into the prepared tin and press down into the corners. This then needs to be cooked for 30 mins in the oven. They keep pretty well in an airtight tin, if they get the chance! 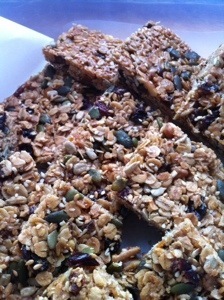 This entry was posted in Recipes and tagged granola bars, Recipe, recipe for toddlers. Bookmark the permalink.